When I have an idea for a short story, I love to start setting up the scenes for it. After I’ve developed my plot, I divide it up into scenes. I usually determine the main purpose of the scenes first and then use bullet points below to describe what’s about to happen. How you start your story, how you set up the first scene, can make or break it. You have to lure the reader in straight away. Once you’ve got the reader’s attention, you have to keep them hooked with every scene. It sounds obvious, I know, but it’s more difficult than you think. Your story must move forward. In my journey as a (short) story writer, I’ve learned a lot about writing great scenes. I hope you can successfully apply these tips to your (short) story writing as well. When you start your story, devise a scene that sets the tone! Often writers start with a great character moment. I think this is one of the best tips out there. The reader will develop a relationship with your character(s) in the first place. This could be an emotional moment or something that frustrates the character. Another interesting way to start a story is with a conflict between your main characters. When you bring the reader into your character first, show the reader what your character wants and introduce their place in the world. If you have an interesting and extraordinary world, tie that in. What does your character think about that world? What’s happening? Another tactic I like to use is to start with something out of the ordinary. To basically introduce new concepts and ideas that make the reader want to know what the hell is going on. Once you managed to write a great beginning, you’re all set to continue your story. Earlier, I wrote about how you can structure your story. Let’s say you use the traditional 3-act structure. I use this most of the time as well. The tricky part with this structure is that writers tend to focus more on the beginning and the end. This way, the middle part ends up in a mess of description that tries to tie act one and three together. This middle part is the buildup Anne Lamott mentions in the quote above. Let’s zoom in to what Lamott is saying about the buildup: “The buildup is where you put in all the moves, the forward motion, where you get all the meat off the turkey.” A lot of action is happening in the middle part. Therefore I’m always disappointed in short stories that have a great setup but then completely lose me in the buildup. It’s like the writers care more about the outcome than the journey. Use your talents to put in all the moves of your character, make the journey towards their destination as interesting and gripping as possible. Scenes are a mix of descriptive prose and dialogue. The most important thing to consider (in any act) is that your descriptions or dialogue move the plot forward. In this article, I’d like to focus on descriptive scene writing. I will dedicate another article solely on writing dialogue in the future. 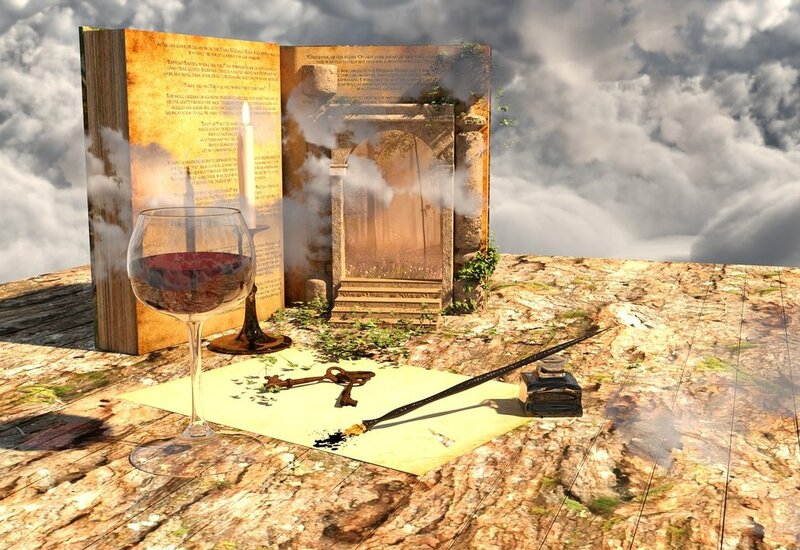 With descriptive writing, you introduce different settings, describe the emotions of your characters, their views, and the things they encounter. If you’ve built an extraordinary world, you need to describe that to your reader as well. The key to descriptive writing is to NOT INFO DUMP! Make the descriptions gripping and interesting. Use the senses. Not merely describe something, but describe it through the eyes of your characters. What do they think about their environment? To level up, combine description that supports the conflict and progress in your story. For example, you can describe a room in full detail. That way the reader can form a good image of where your character is. But is that gripping? That’s info dumping. What does the reader need to form an image? Try describing only the things that are necessary to your character(s) movements. So for that same room, describe the chair he’s sitting in, the food he’s eating at the dinner table, or the object he needs to solve a mystery. I hope you get what I mean. Pick 1-3 things and create a setting that’s unique and supports the progress of the story. In the book ‘Bird by Bird’ by Anne Lamott, she introduces a great exercise to get your descriptive writing skills flowing. Pick a memory and write everything down you can remember about it. Write about your childhood or a beautiful trip you went on. Where were you? Who were you with? How did you feel? What did you see? Use your senses. All these questions are tied to you (similar to what you need to do with how your characters experience a setting). It’s one thing to describe the environment, your characters, actions, etc. It’s another thing to write it in beautiful prose suited to your voice. What styles of prose do you like and why? How do they enhance the story? The last question is important. I believe it’s suiting to use a form of prose fitting to your short story. A fantastical short story requires a different form of prose than a dramatic fiction story. Most importantly, use the words you know in the style that you like. Don’t pretend. If you get only one thing from this article then please remember to create an interesting story with great scenes and character moments. We arrived at the destination of your story. It’s time to solve issues, find solutions and show what your characters have learned. What message have you been trying to bring across? Make it satisfying to both your reader and yourself.